...the crater edge of the greatest volcanic explosion in human history (also known as Lake Taupo in New Zealand). Its last eruption was recorded by Roman and Chinese scholars in AD180. Perhaps living beside this sleeping giant explains my drive to make books – I want to leave my mark on the world before the world leaves its mark on me. I came into this world in 1971, a stone’s throw from the golden beaches of Perth, Australia. Alas, my life as a bronzed, speedo-wearing, barbarqued-prawn-eating surf god was not to be. Instead my family returned to New Zealand and I grew up in the central North Island, half way between the Hobbiton and Mordor locations in Peter Jackson’s Lord of the Rings. The bush and geothermal areas around our home were great adventure lands, where spiky Cabbage Trees became Dr Suess' Truffala Trees and the stone strewn hills were a perfect stand-in for Bill Peet's Droofus The Dragon. Artistically my early years were dominated with dinosaurs, and I created such classics as Person without a Skellyton. As I got older others began to take full advantage of my drawing skills. Mum used my drawings for her high school classes, and pictures of Kenworth trucks were a great way to get the school bully on-side. At the age of seven a major creative input came into my life, when mum read us The Hobbit and The Lord of the Rings. This was an amazing source of material for an imaginative little mind, which kept me going for years. My grandmother would be horrified as my Grandfather encouraged 'more gore!'. An illustration of Shelob and Kentucky Fried Frodo is typical of the period. Soon after I discovered Asterix and Footrot Flats, and I began drawing funny little comic strips of my teachers and classmates, utilising such time honoured lines as 'the students are revolting!'. When the family moved to Indonesia for 4 months I spent my time maintaining a detailed comic of everything I saw. When our correspondence work didn't arrive for 3 1/2 months it became an obsession. High School art took me someway down the path to a career in art. But it was my parents who introduced me to something I never even knew existed – Graphic Arts. At the end of high school I was accepted into the AUT school of Art and Design in Auckland. 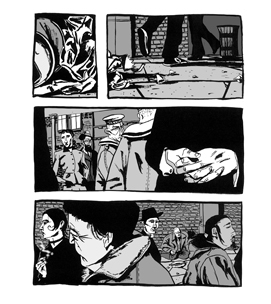 This was what I was after – and dark and twisted paintings for graphic novels were the order of the day. Emulating my heroes, Kent Williams and Dave McKean, I created an attitude laden 90 year old character of myself, who lived in some totalitarian future. That was until final year, when we were informed that we had to prepare for a real job. The early 90s were a tough time, and when no-one leapt at the chance to employ me, my wife and I started our own design business, Magma Design. I soon fell back on my illustration skills doing storyboards for TV Commercials. 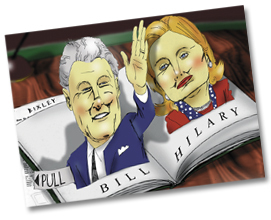 My first big break came doing regular editorial illustrations for The Listener magazine, which I did for 6 years. Since then I've illustrated more than 100 books, published in 31 countries, translated into 18 languages, and I have been awarded as both a writer and illustrator, and also as a book designer. My most recent award is for my junior fiction series Flying Furballs (Upstart Press 2016). Book 1 Dogfight, won the 2018 Tatoulu children's choice award in France. In 2017 I was the recipient of the New Zealand Arts Foundation Mallinson Rendel Award, for lifetime achievement as an illustrator. I am a two time recipient of the International Youth Library's White Raven Award (listing the top 200 children's books in the world) for: Fuzzy Doodle (written by Melinda Szymanik, published by Scholastic NZ) in 2017, and my innovative hybrid part-novel, part-comic Monkey Boy (Scholastic NZ), in 2015. 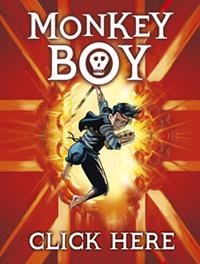 Monkey Boy also won the top prize for junior fiction at the 2015 New Zealand Book Awards for Children and Young Adults. My illustrated biography Much Ado About Shakespeare won the Russell Clark Illustration Award for best illustration at the 2016 NZ Book Awards for Children and Young Adults. I enjoy working across a broad range of books, from my illustrated biographies Faithfully Mozart (Upstart 2018) and Much Ado About Shakespare (Upstart 2016), to my best-selling pre-school books The Wheels on the Bus (Hodder Moa 2010) and The Looky Book (Hodder Moa 2012). In 2014 my work on The Three Bears Sort Of (written by Yvonne Morrison, published by Scholastic 2013), won the Overall Children's Choice at the New Zealand Post Book Awards for Children and Young Adults, taking a staggering 2/3 of the 15,000 votes. Three Bears Sort Of also won the Children's Choice at the 2014 West Australian Young Readers Book Awards. Other notable books include my wordless picture book The Weather Machine (Hachette 2013), and one of my personal favourites was illustrating Margaret Mahy's Dashing Dog (Harper Collins 2013). I am co-creator of the hit international series Dinosaur Rescue (with Kyle Mewburn, published by Scholastic 2012-2015) which has been a number one bestseller as far away as Norway. Having fun is playing guitar, piano and saxophone. I'm also the singer and percussionist for a 13 piece funk-jazz ensemble "Hot Tub". I love getting up on stage for the odd muscial and have played Marius in Les Miserables and Frank in the rock horror comedy musical Fang. Unfortunately I don't have time anymore for windsurfing, yoga and volleyball. I live in Taupo with my wife and 3 daughters.